In December of 1866, Rev. 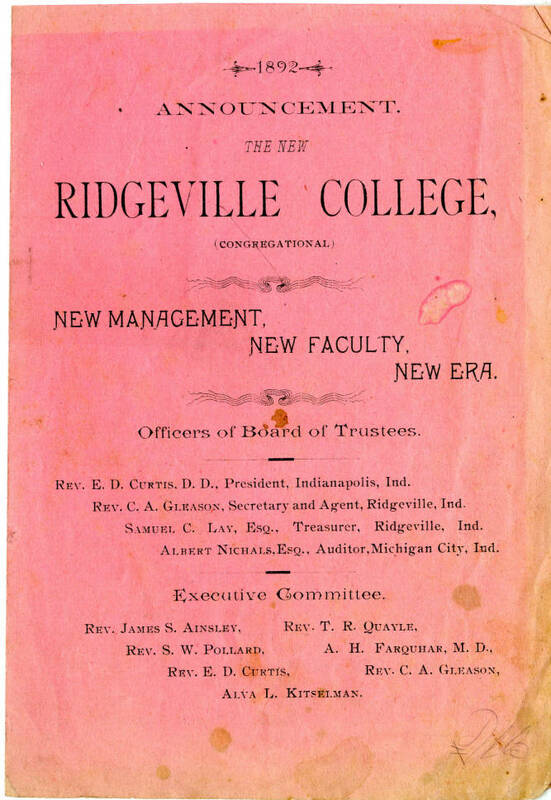 John Collier, a group of Free Will Baptist ministers and a few enterprising citizens of Ridgeville, Indiana founded Ridgeville College, nestled in Randolph County. Despite local interest and promising enrollment, the college started off slowly due to lack of funds and the absence of an endowment from the ministers’ Free Will Baptist denomination. 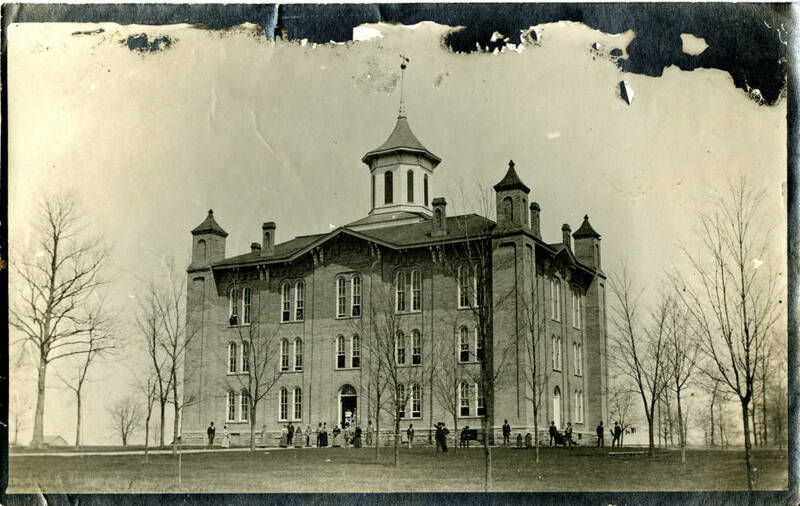 Eventually, without funds and slowly heading toward closure, the Congregational Church of Indiana took over the college in 1892. With a faculty of eight men and women, William C. Kruse served as acting president. Initially, the five-acre campus was donated by local citizen Arthur McKew. In the 1870s, the four-story main building was completed. It housed class rooms, a 400-seat college hall, a 150-seat chapel, a 2,000-plus volume library and a large basement kitchen. The building not only served the students, but it served the community as well by acting as a local social and entertainment venue. 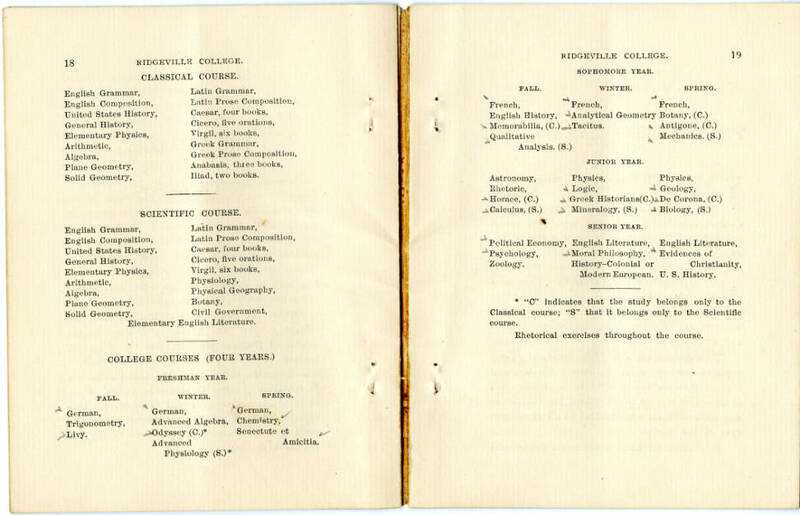 Originally, the college offered two courses of study: the classical course that would lead to a Bachelor of Arts or the scientific course that would lead to a Bachelor of Science. However, when the new leadership began, the college focused on three main principles: scholarship, experience and Christian character. Commercial, normal, music, stenographic, typing and writing departments were later added with specifically-qualified teachers. 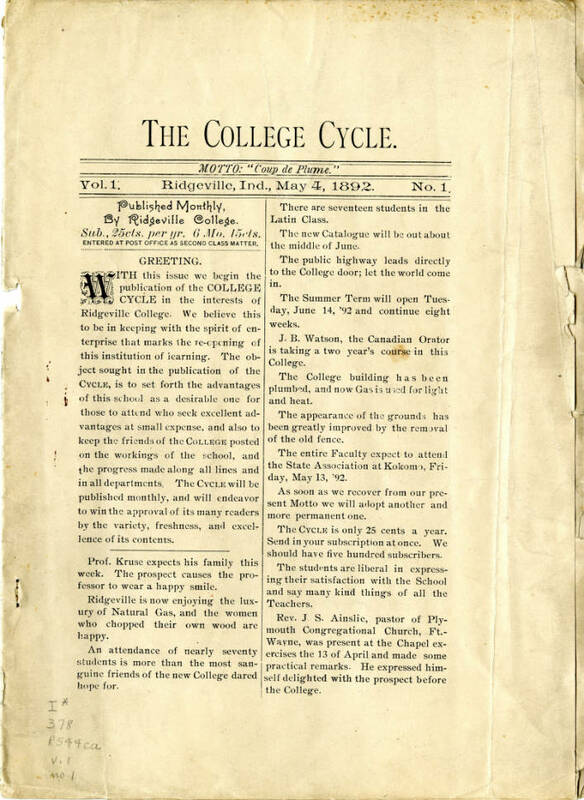 The students published the first issue of the college newspaper, The College Cycle, in May of 1892, with its motto being “Coup de Plume,” translated as “Stroke of the Pen.” The newspaper included school announcements, faculty activities, a several-page essay and a section of advertisements of local businesses. Ridgeville College closed after the spring term in May 1901. The main building stood empty for a period until the Lay Brush and Broom Company occupied it. Eventually, the company vacated and the building was razed in 1932. The Indiana Division of the Indiana State Library has a small collection of materials from the closed college. 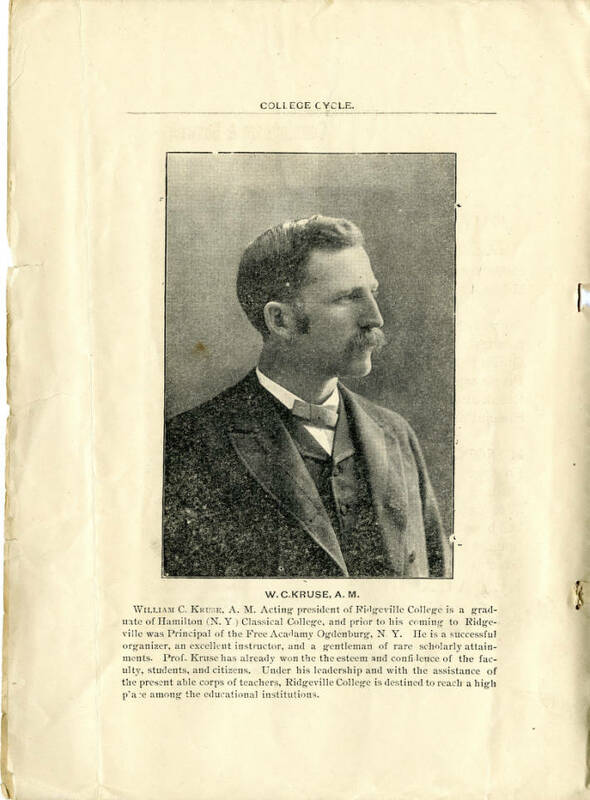 They can be found in our newest digital collection, Education in Indiana. Randolph County, Indiana, 1818-1990, compiled by the Randolph County Historical Society. 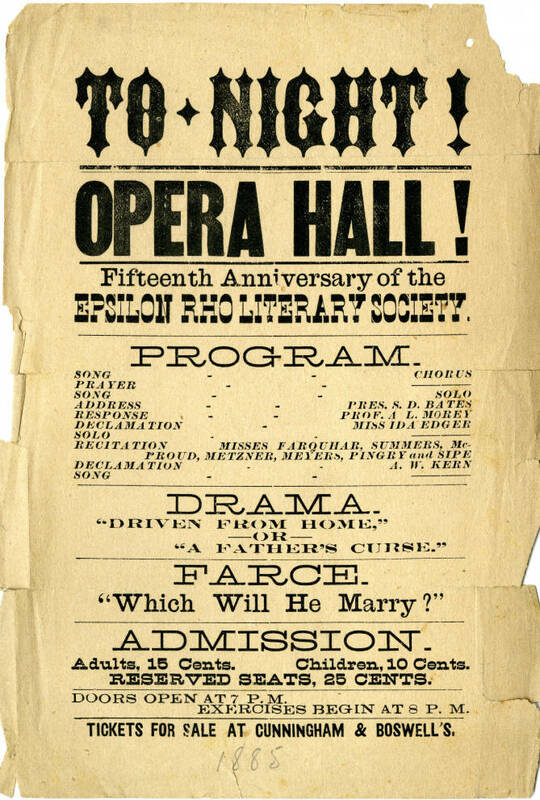 This post was written by Chris Marshall, digital collections coordinator for the Indiana Division at the Indiana State Library. This entry was posted in Indiana Division and tagged college, county, randolph, ridgeville by indianastatelibrary. Bookmark the permalink.